Get ready for thrilling action and adventure with Jurassic World! There's a mysterious villain stalking the area and he's after anything or anyone that moves! Straight from the film, Indoraptor wreaks havoc and fear with his mere presence. His ominous features include slick black scales, long arms with dagger-like claws and extra articulation that he will use to catch anyone that crosses him. Act out ferocious battle scenes with Indoraptor and relive all the exciting adventure of the movie! Colors and decorations may vary. Stalking the area, there's a mysterious villain that hunts down anything or anyone that moves! I bought this for my son and within the first day, the tail broke off. I'm trying to glue it, so hopefully it holds as he was very excited for this toy. This is the 4th one that I have purchased & all of the dinosaurs tear apart in the same manner. Either the hands break off or the tail does not last long. I've never had a product of such poor quality. I only continued purchase because my son is autistic & this has become his favorite toy but i will no longer waste money on a horrible product. We're so sorry that this has happened. Please contact our Consumer Services at 800-524-8697 for assistance. They are available Mon.- Fri., from 9:00 a.m. - 6:00 p.m. EST. Only after a few minutes of being played with the tail broke off. My son is devastated. Please don't waste your money like I did ! Please give our Consumer Services team a call for assistance with your son's Dino. They can be reached by phone at 800-524-8697, support is available Mon.- Fri., from 9:00 a.m. - 6:00 p.m. So disappointing! Broken tail and missing spikes! I gave this to my son today for his birthday. I should I have read the reviews. He had it for all of 15 minutes before the tail broke off. And we then also discovered the back is missing two of his three rows of spikes! The indoraptor was all he asked for for his birthday and now he is in tears and so am I! 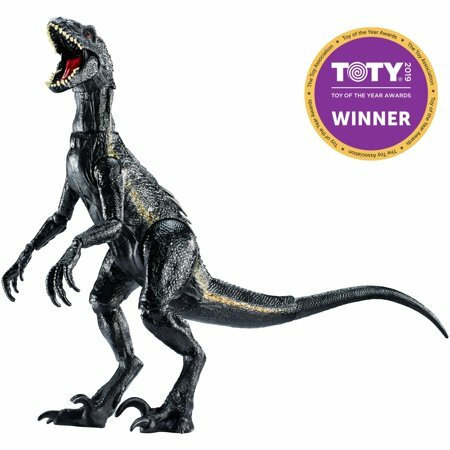 Just bought the Indoraptor for my son yesterday and a few hours later the tail broke off! My son was upset because he was very excited to get this dinosaur and now it has a broken tail!